Street Christmas Decorations — Last Sunday nine members erected the street Christmas decorations for the Chamber of Commerce. Thanks to Campbell Ford (Chamber Rep.) who we liaise with to get the job done. Also thanks to the North East Home Improvement Centre who lend out their mobile scaffolding at no charge. 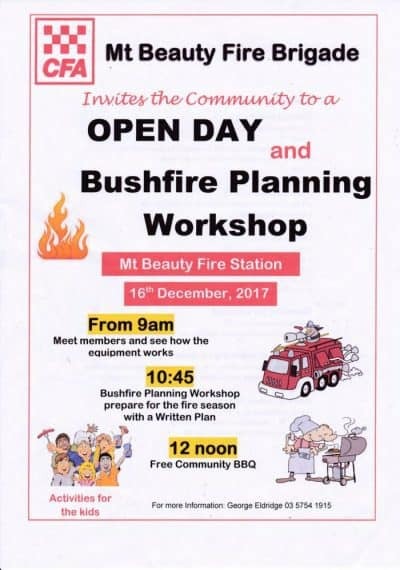 Open Day & Bushfire Planning Workshop by the Mt Beauty Fire Brigade – Saturday 16th December (refer to notice below). Shed Cleaning Roster – All regular Shed participants and committee are included on the Roster. Starts 16th January 2018 with two members rostered on to clean the Recreation & Kitchen area and the Toilets & Washroom. All members will receive a copy of the roster prior to Shed reopening after the holiday break. Workshop clean up is the responsibility of the member working in that Shed space. Shed Holiday Dates — Closing on Wed. 13st Dec 2017 & re-opening Tuesday 16th Jan 2018 with a sausage sizzle at 12 noon. Erecting Street Christmas Decorations: Left (bottom) Brian Keeble, Len Sims, Mark Hardidge & Doug Hamilton. 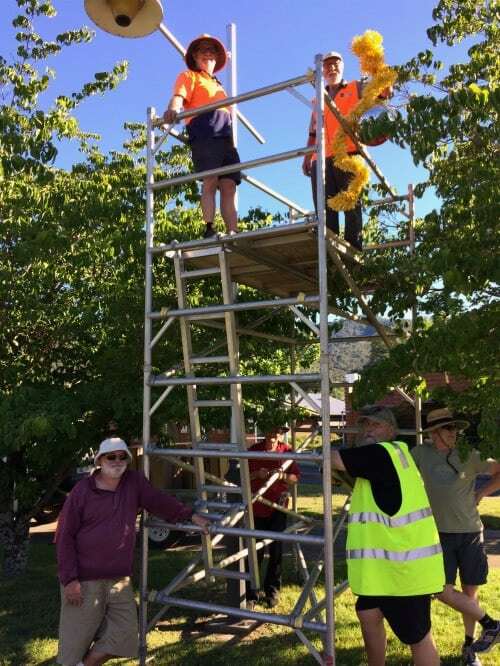 On the scaffolding: left Bruce Brereton & Noel McDougall. Thanks also Bob Ferris & Barry Hinson who assisted.